On 29 October 2015, PHISO obtained accreditation as Partner Organization of the International Studies Association (ISA), the premier, most respected, and widely known scholarly association in fields of international studies. Thus, making PHISO as the first and only Filipino professional organization of International Relations recognized by ISA. On 17 February 2016, Nassef, the vice president for publications, became the Content Creator of the Research and Content Development Department, ASEAN Young Professionals Network (AYPN). Nassef is keen to forge common grounds between PHISO and AYPN by holding joint activities in the near future. On 18 February 2016, PHISO became an associate body member of the World Conference Alerts to disseminate future activities in the world of cyberspace. WISC Membership Accession Request from PHISO signed on 22 November 2016. 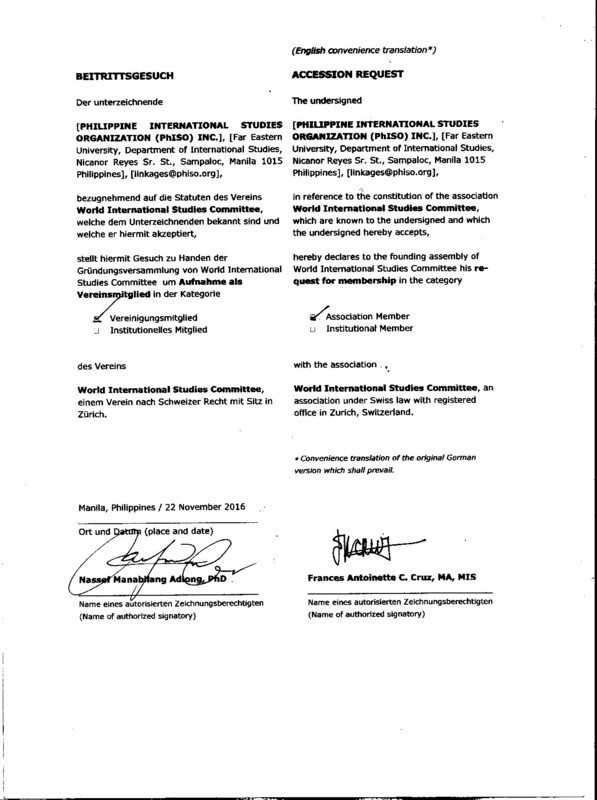 On 19 March 2016, PHISO became a member of the World International Studies Committee (WISC). The only leading network of associations of International Studies worldwide. On 18 May 2016, PHISO became an affiliate member of the Global South Caucus of International Studies (GSCIS), one of the caucuses of the International Studies Association. Details of our membership are available here. On 10 June 2016, PHISO signed a Memorandum of Understanding with the Asian Institute of Diplomacy and International Affairs, a foreign policy think tank based in Nepal. On 27 November 2016, PHISO signed the Country Partner Agreement with College of William and Mary’s 2017 TRIP Faculty Survey. On 18 January 2017, PHISO became an institutional member of the International Political Science Association (IPSA), the voice of political science around the world. On 02 August 2018, PHISO signed a Memorandum of Understanding with the School of International Studies of the University Utara Malaysia. On 29 January 2016, PHISO initiated a collaboration with the ‘Forging a New Philippine Foreign Policy‘ project headed by Professor Aileen SP. Baviera and assisted by Sascha Gallardo. On March-April 2016, the Helena Z Benitez School of International Relations and Diplomacy (HZB-SIRD) of the Philippine Women’s University became PhISO’s first institutional partner.